One of the most refined brains of our times, a young girl who made headlines when she made her mark by becomeing the youngest Microsoft Certified Professional (MCP) in the world when she was just nine years, nine months and 11 days old in 2004. The entire nation prayed as she struggled between life and death for almost a month and mourned profoundly when she passed away on January 12, 2012, at the tender age of 16. She will always be missed and everyday millions of prayers will be sent to her from a nation that saw with utmost pride and awe when she conquered a difficult task - that of becoming a Microsoft Certified Programmer - and achieved global fame. She brought with her hope and confidence and left for us a lesson that the future generation will benefit from. She was a visionary and had the dream of building an institution for education of poor children to help them achieve excellence and fulfill their dreams. Her father in an interview on TV after her passing away said that he will not mourn but cherish her memory as she came in this world to give a message and that he will continue to follow her path and with God's help he will achieve it too. 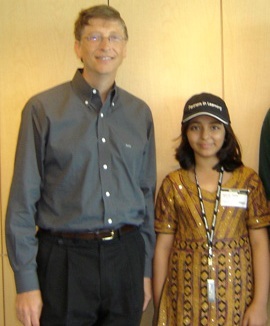 At the age of 10, Arfa Karim was invited to visit the Microsoft Head Office in USA on an invitation to meet the Microsoft CEO, Bill Gates. She was invited by Microsoft to be a part of the keynote session in the Tech-Ed Developers conference in Barcelona in November 2006. 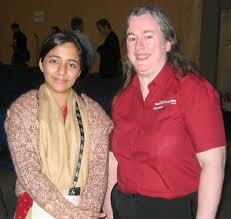 She was the only Pakistani among over 5,000 developers in that conference, themed “Get ahead of the game”. She was also the youngest recipient of the prestigeous Presidential Award - Pride of Performance. She was also awarded the Fatima Jinnah Gold Medal in Science and Technology. The brilliant teenager passed away after complications resulting from an epileptic stroke. Pakistan media reports say that Karim went into a coma on December 22 after suffering an epileptic attack and cardiac arrest. She was admitted for treatment at Combined Military Hospital in Lahore and was on life support at the Intensive Care Unit when she suffered a tracheotomy complication. Condolences poured in from around the world. Microsoft's Founder Bill Gates, who offered to pay for Karim’s treatment, told the family he was sad to learn of her death and for the loss of such a rare talent. Her funeral prayers were attended by the Punjab Chief Minister Shahbaz Sharif along with a large number of military officers and civilians.Funeral prayers were offered on Sunday in Lahore before her body was taken to her native village Ram Dewali, Faisalabad for burial. Punjab Chief Minister Shahbaz Sharif said “Arfa’s centre of gravity was wanting to improve human resource development by focusing on education”. He also thanked the CEO of Microsoft Corporation for his offer to help in her treatment. We need to acknowledge all our high-achievers through websites like these. We also need to bring forth the contributions made to the country's prestige by other great people like Arfa Karim - whether they are with us today or not. Arfa will always be greatly missed and will remain in our prayers.